Oath Ad Platforms Fireside Chat with John Koestier, Singular from Oath on Vimeo. I’m also a frequent webinar facilitator or panel member. 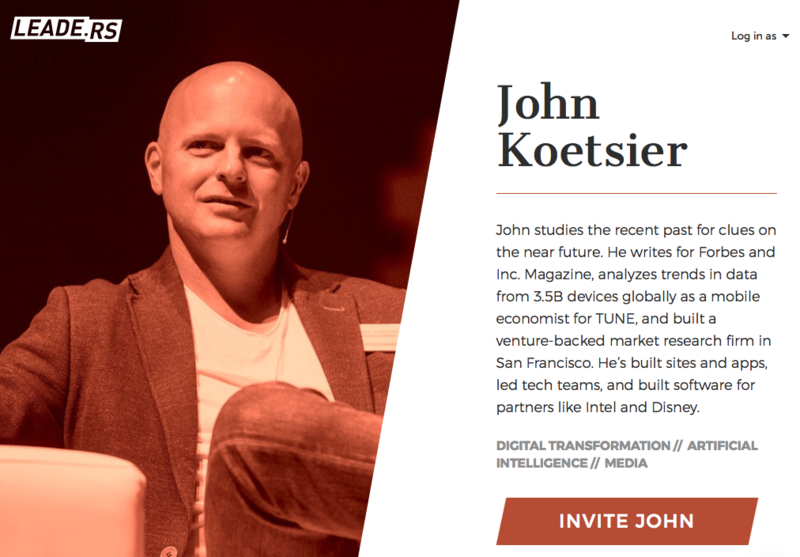 When leading VentureBeat’s research division, I would often lead 2-3 webinars a month. I’ll be moderating panels and interviewing major automotive brands on-stage about self-driving cars and other autonomous tech. A fireside chat with Microsoft Canada CMO Katia Houbiguian. I will be interviewing Shark Tank’s Robert Herjavec on-stage as well as moderating a panel. I’ll be moderating a panel and reporting on the summit. 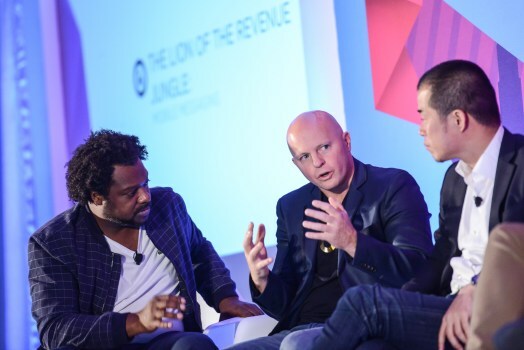 I will be moderating a panel on values, brands, and how values marketing is resonating with audiences and customers. It’s the mobile event of the summer! I’ll definitely be speaking, possibly moderating, and maybe MCing … as I did the past two years. We’ll be talking about identity in an API world … a very relevant topic given our collective recent focus on privacy. I’ll be moderating the conference. I’ll be on a panel about AI and advertising. I’ll be speaking on leadership lessons, marketing challenges and career development. Will be judging the competition. Will be delivering a workshop on innovation and the future. 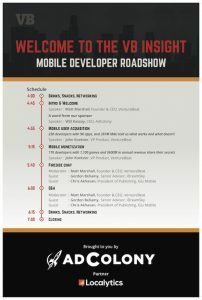 Agenda from a mobile developer roadshow event in SF, Seattle, Vancouver, Toronto, and Montreal. 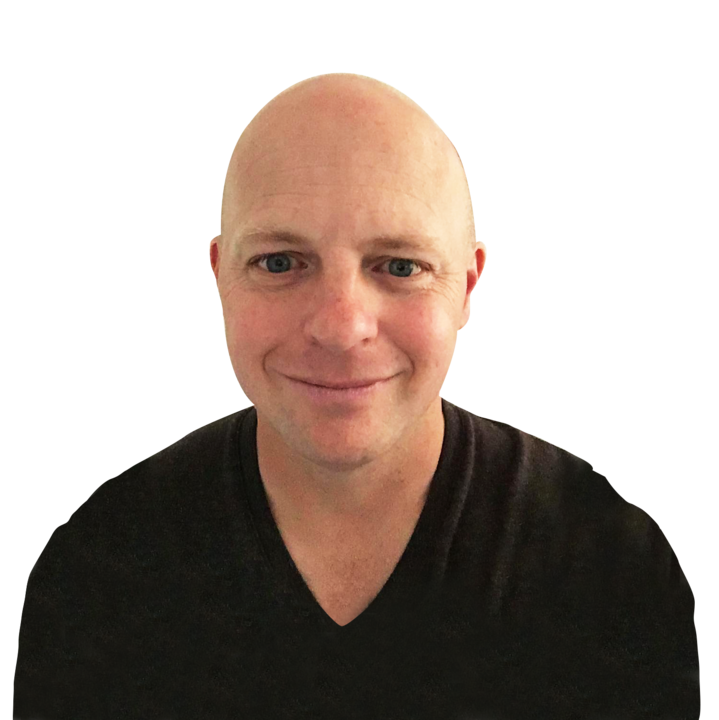 I’ll be speaking on a panel at the Local Search Association in San Diego. Topic: Who owns the last mile, and I’ll has the happy task of telling local search pros that Alexa, Siri, Google Assistant, and Cortana just might be killing them. I’ll be moderating a discussion influencer marketing and mobile. See the livestream of the event here. Will be sharing some very cool and very recent data on app store optimization, mobile ad fraud, and maybe even the impact of mobile on enterprise company valuations. Will be appearing on Peggy Anne Salz’ podcast. She’s the founder and CEO of Mobile Groove, a mobile and marketing-focused research and consulting firm. Will be interviewing the mayor of Edmonton, the CIO of City of Palo Alto, and the CEO of Citrix in the opening panel of the conference. Will be moderating a panel. MCing TUNE’s mobile event of the summer. Join me! I blogged the event as well as interviewed Tesla CTO JB Straubel and other luminaries, such as Amber Case, Melissa Hathaway, and Kik CEO Ted Livingstone on-camera for the event organizers. I spoke on an AR/VR panel. I’ll be speaking on a panel about augmented reality. I will be hosting and facilitating several VIP dinners and events for Read-Write. Will be speaking at the event on how journalists choose their stories. Moderating a session at Interzone with Bill McDermott, CEO of SAP; Jessie Adcock, chief digital officer, City of Vancouver; Ryan Holmes, CEO, Hootsuite; and Jackie Yeaney, SVP of Marketing and Strategy, Red Hat. Contact me via one of the social networks at top right to book speaking, webinar, and panel opportunities. Note that my speaking fee is typically $2,500 plus expenses. Every conference asks for videos of previous talks, a bio, and a picture … voila!